Little confession here: when I first saw Netlify CMS at a glance, I thought: cool, maybe I'll try that someday when I'm exploring CMSs for a new project. Then as I looked at it with fresh eyes: I can already use this! It's a true CMS in that it adds a content management UI on top of any static site generator that works from flat files! Think of how you might build a site from markdown files with Gatsby, Jekyll, Hugo, Middleman, etc. You can create and edit Markdown files and the site's build process runs and the site is created. Netlify CMS gives you (or anyone you set it up for) a way to create/edit those Markdown files without having to use a code editor or know about Pull Requests on GitHub or anything. It's a little in-browser app that gives you a UI and does the file manipulation and Git stuff behind the scenes. 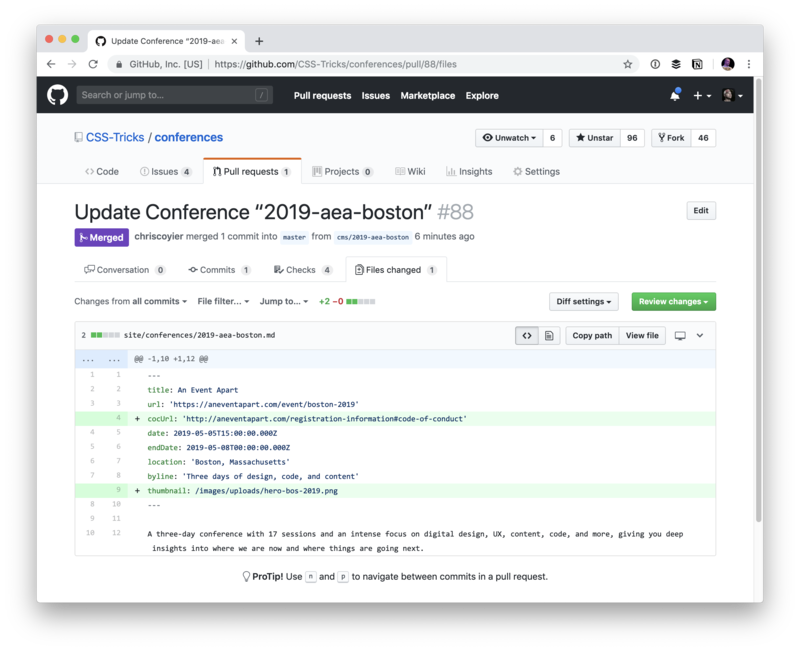 It's on GitHub, so it's open to Pull Requests, and each conference is a Markdown file. That's pretty cool already. 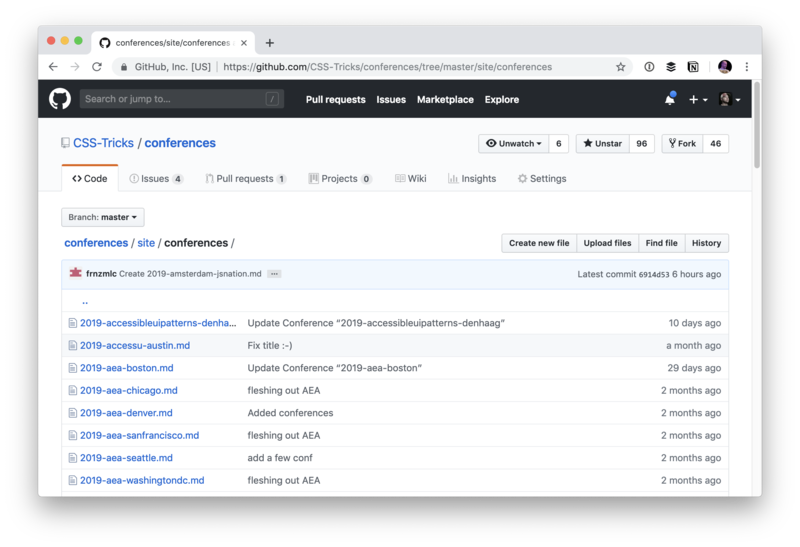 The community has contributed 77 Pull Requests already really fleshing out the content of the site, and the design, accessibility, and features as well! It's two files! That still kinda blows my mind. It's a little SPA React app that's entirely configurable with one file. Netlify CMS doesn't do anything forceful or weird, like attempt to edit the HTML on the production site directly. It works right into the workflow in the same exact way that you would if you were editing files in a code editor and committing in Git. The Git magic happens through a technology called Git Gateway. 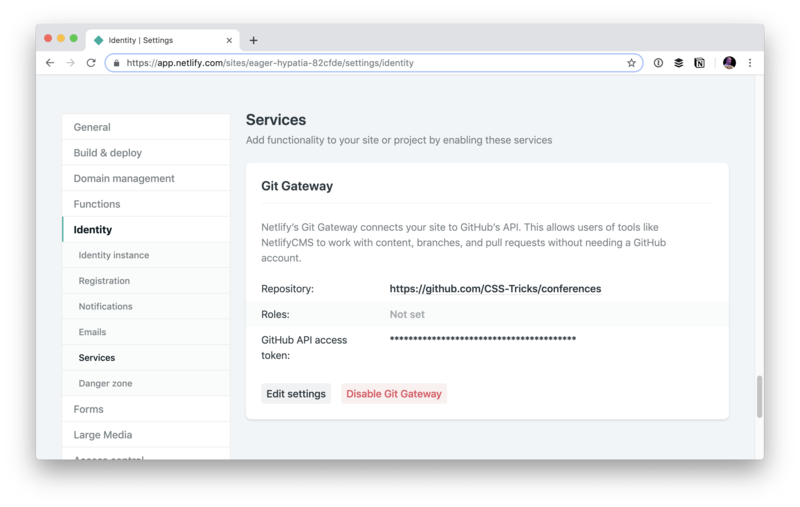 You don't have to understand it (I don't really), you just enable it in Netlify as part of Netlify Identity, and it forms the connection between your site and the Git repository. 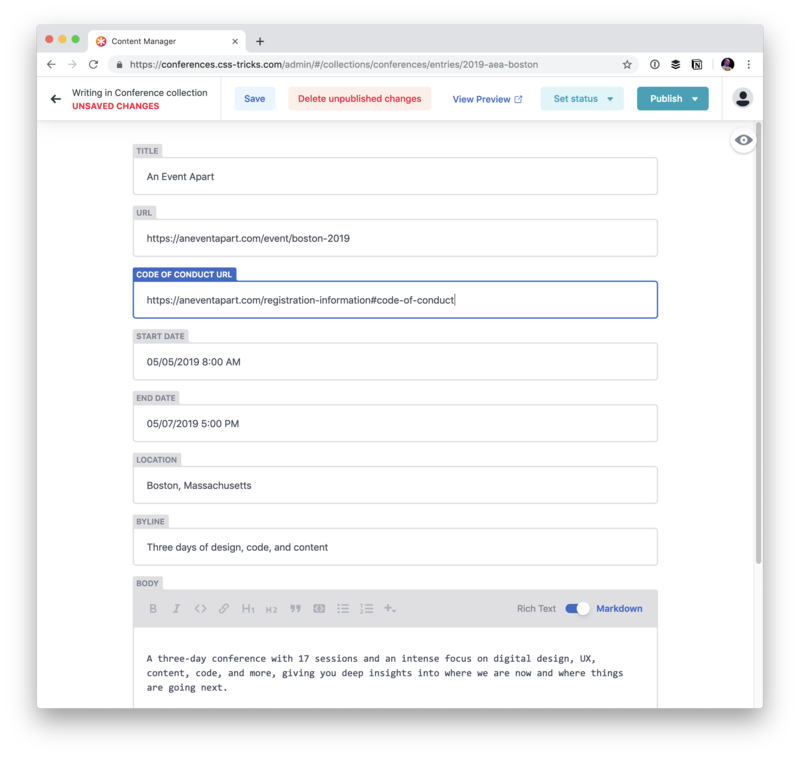 When making the switch from WordPress to Hugo, not having some sort of back-end was kind of scary, but when I discovered Netlify CMS… I was a happy camper. It’s so easy and efficient, I almost feel like I don’t deserve to use it. I can’t wait to test this out for our next project. We have been getting too dependant on WordPress lately. Hello Chris. I recently published an npm package to CRUD domain data entries generated from Mardown/JS files, using the CLI. 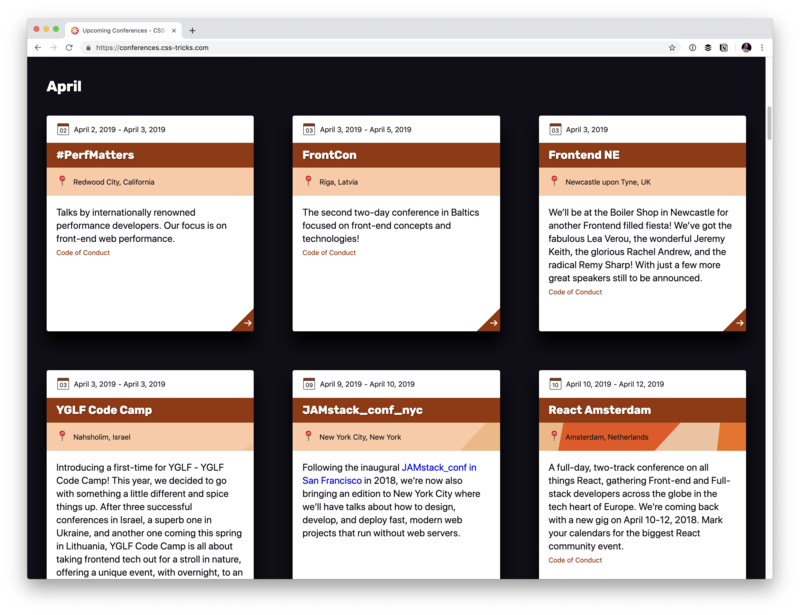 I was thinking about next features like a React component to edit content in browser on front end with instant update, and also a feature to handle “versions” of an entry. I comitted the latter this week. 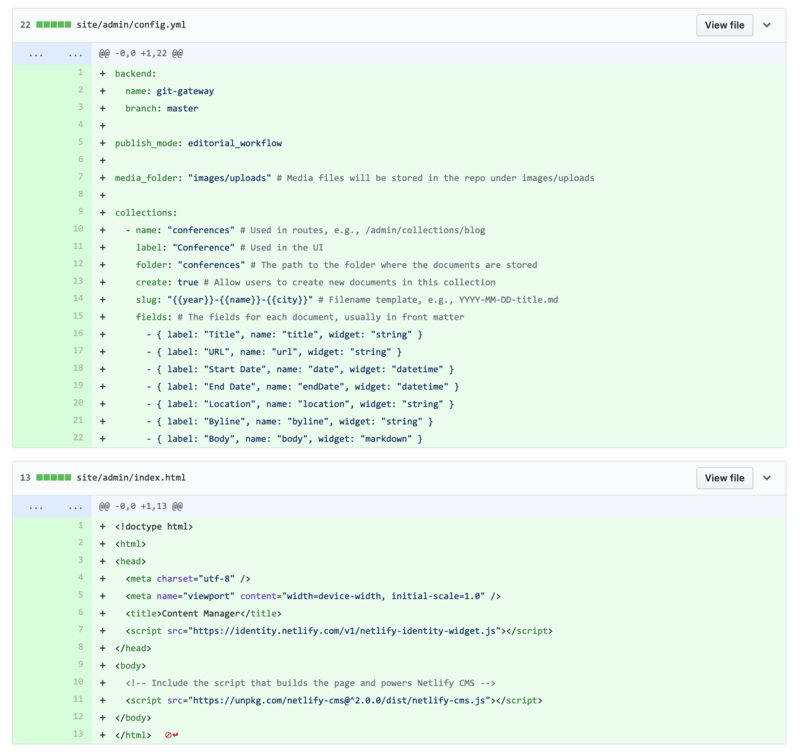 I was handling another feature to cache endpoints using a content based hash in their filenames, and I was also anticipating the need to publicly show differences between edits of an entry, and naturally thought that Git and/or Github and its API already are giving that. Storing data on Github and use it from your own website seems similar as what’s described above but it concerns Github Pages, not Repositories. Did you check that this usage is authorized? There’s also the limit on requests to Github API but it might be high enough to handle low/medium trafic websites.